Typical Roman adornments on helmets included tall, striking hair plumes, although others were used. And on the Brass Charioteer Helmet, instead of a classic, stiff hair plume, the helmet features a simple black hair tassel as decoration. This helm differs in appearance from the typical Roman imperial helmet, although given the nature of a charioteer, a slightly more solid helmet does not necessarily seem like a bad idea. This helmet features a rounded top without a visor, as well as a slightly curved back that is designed to protect the neck. The ears are not left open (unlike on other Roman helmets), and the sides of the helmet are rigid and stiff, while the face is left fully exposed and open. The top of the helmet features a conical decoration, from which hangs a long, black hair tassel. 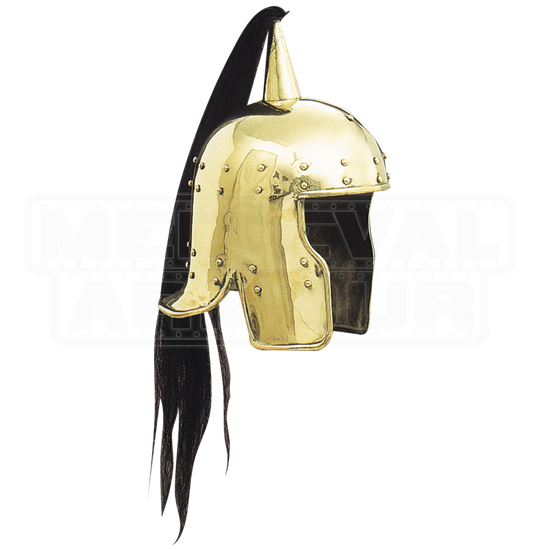 The helmet is made from quality metals and features a polished brass look set with numerous rivets for reinforcement. Of course, the Brass Charioteer Helmet would make a great addition to any charioteers appearance, although it could also look great when worn by a wide assortment of other Roman warriors. It goes without saying that this helmet would also look great in any historical enthusiasts collection.